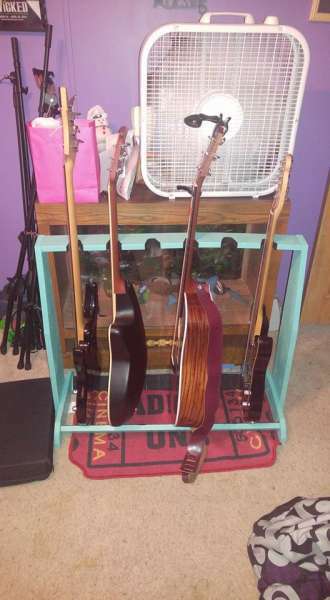 Guitar stand built for my daughter. That's purdy cool!! Sounds like you're going to have some more shop time!! With that many guitars she must quite talented. I tried to learn how to play once but after the third lesson ....... I was quietly pulled aside and it was suggested that I should just spend more time in the shop. I don't know if it was being late all three nights because of glue-ups taking longer than I wanted or his dislike of me leaving hardened glueified ( yep that's a new word I just made up) finger prints on his guitar. It might have been me putting his guitar in the bench vise I found in his garage after class just so I could give it a good look over but ..... who knows these things ?